All of the above men were executed by the British Government for their efforts in trying to secure a free Ireland! and strikes for her freedom. in arms. 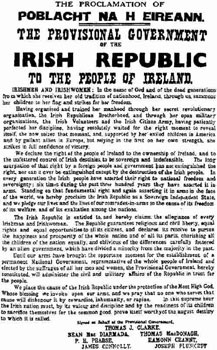 Standing on that fundamental right and again asserting it in arms in the face of the world, we hereby proclaim the Irish Republic as a Sovereign Independent State. And we pledge our lives and the lives of our comrades-in-arms to the cause of its freedom, of its welfare, and of its exaltation among the nations.